This section provides an in-depth look at all the Trade Exchange News of 2005.
International Monetary Systems Upgraded To "Strong Buy"
Investrend Research analyst Gary Vassalotti has upgraded the IMS stock (OTCBB:INLM) to a "Strong Buy/5." The full report, including important disclosures and disclaimers, is available at www.investrendresearch.com. IMS is enrolled in Investrend's pioneering professional research program, which facilitates independent analysts to provide coverage for shareholders in companies that otherwise would have little or no analyst following. International Monetary Systems, President Don Mardak is pleased with the latest rating. "We believe that Investrend's projections are well in line with our own. Furthermore, as a result of our recent presentations at the EdgeWater and Arch Investment Conferences, along with our continuous flow of good news, our stock's trading volume has been steadily increasing." On December 7, Chris Lahiji, President of Small Cap Research at DailyTrends.com, selected INLM as his �Stock Pick of the Week,� placing a $0.55 twelve-month price target on the International Monetary Systems� stock. He� a regular guest on Fox Business Television and the founder of Lahiji.com. Lahiji�s investing talents were written about in a Business Week Magazine feature article in 2003. DailyTrends.com is an Internet based financial web site that provides self-directed investor information on selected public companies that in the opinion of DailyTrends.com have great investment potential. The writing is on the wall, regarding threats to the commercial barter industry from cash or new cash-equivalent online systems. Because, essentially these live 24/7 online systems are producing technology that empowers the buyer to clinch �deals� (smartshopper.com) that might otherwise be a market open to a barter pitch. This is particularly true with intangible services such as hotel accommodations, which is the focus of our group. Online technology allows rooms to be sold as commodities, prices rising and falling with market demand. Try getting a room in New York City next week on barter. It�s almost impossible to find for cash, in fact Intercontinental Hotels do not have a single room available mid-week. This technology allows for �accessible/available� products and services to be available in database after database, but on a live, first come, first served basis. For example, a company might have 100 SKU�s of product available, however the ubiquitous nature of the online technology has these products omnipresent on 200 different sites simultaneously! Seemingly 20,000 units are available in cyberspace at a particular instant. That�s a mind-boggling 2000% factor, that�s leverage. In the blink of an eye these rooms can be sold before the hesitant buyer hits enter! If the commercial barter industry embraced open cyber trading systems and volume based fee sharing, similar leverage factors of 2000% and greater could be achieved. That�s velocity. For the barter industry, the world is flat and quickly getting flatter! And it�s a double-edged sword. With increased collaboration power and affordable robust technology converging, some remarkable possibilities are on the horizon...but so are the incidences of rogue operations. It�s the nature of the beast. In many fields, rogue operators are non-starters, or are eliminated before much harm is done. For instance, matching software is harmless�yet powerful, absolutely. But the worst thing that can happen is a bad swap. I�m excited and also concerned that the cashless trading industry, which commercial barter has pioneered in such a significant way, may be on the verge of a quantum leap...but also may be destined to repeat history at the same time. An investigation, such as occurred decades ago when we were much younger and less developed, could irreparably set our collective vision back. For those of you who were around back then, imagine what it would have been like if the International Reciprocal Trade Association (IRTA) had not been formed and the IRS was successful thus in their �John Doe endeavor� to extinguish the use of commercial barter through the trade exchange model. My concern today stems from the proliferation of barter software (for exchange networks) being marketed to commercial and non-commercial exchange networks. There is an incredible naivet� about the responsibilities involved in maintaining a solid exchange network and how to identify a system that is aiming only to expand the distribution of its own trade credit. It seems like many people or groups still have an agenda driven by the desire to be the first, the biggest, the most...in short, to claim responsibility (take the credit) for the quantum leap anticipated. This makes no sense to me. Not only is it selfish, it�s silly. Didn�t we all chuckle when Al Gore reportedly claimed to have discovered the Internet? I feel IRTA�s job at this time is to continually upgrade membership requirements (quality and management standards), educate the public, and work to steward the collaboration needed to nurture an expansive, responsible and UNIFIED cashless trading world. No small feat. Regarding last week�s comments by Thomas Greco about Matchbin (formally known as Barter Farm) I am unaware of their agreement with eBay and I�m uncertain that I understand what Greco means about eBay lacking localization. Perhaps he means in conjunction with Matchbin, eBay can potentially replace all the local �swap sheets� that circulate in communities all over the world. Super...then add a non-cash trade credit...a UC perhaps...and now we�re cooking. Regarding the founders of Matchbin, Jon Firmage and Josh Higgenbothem, I liked their enthusiasm and direction when I met them at the IRTA Conference in 2003. They don�t issue a trade credit, but their web site is looking great and the matching capabilities are cool...and their focus on local, but global is right on. Other entrants similar to Matchbin are equally impressive, e.g. Swapz.com and SwapAce.com. I still strive for the Visa vision for the cashless trading world. And I truly believe that this quantum leap will come from within what we know of as the commercial barter industry. I hope it will start to emerge soon, and be led by gracious, ethical, benevolent leaders who will see beyond their own �fiefdom� aspirations or personal glory pursuits. Your article, �Technology, Cash Discounts May Become Barter Industry�s Major Challenges,� in last week's Tuesday Report inspired me to write the following. The Tuesday Report of November 22 warned that technology is becoming �another growing competitor� of the barter industry. This is a warning that must be taken seriously. Fortunately, technology is available to all (to be used) and the barter industry is better positioned than anyone to take advantage of the new technologies. How is that so? The key lies in understanding that the financial advantages that can be offered to trade exchange members are ultimately far more valuable than the marketing advantages that (the barter industry has) heretofore been emphasizing. Your article noted that �today's typical exchange has a preponderance of service businesses as members.� The geographical limitations upon the delivery of services has up to now enabled trade exchanges, with their focus on local markets, to ignore the development of online markets, but that is about to change. Citing technological and market developments such as Craigslist, eBay, and Google Base, with their new focus on local markets and the service sector, the article argues that �a major shift is underway in how consumers and small business owners shop for local services.� The truth of that observation is undeniable, and in fact, understates the case, which is further supported by considering such other market entrants as Matchbin. Their recent partnering agreement with eBay gives Matchbin a reach into eBay's huge established market, plus the credibility that goes with associating with a major recognized brand. In return, Matchbin promises to provide eBay with the localization that it has lacked up to now. Clearly the future of marketing is online, and any trade exchange that does not soon extend its own marketplace into cyberspace will be left in the dust. But the most important point is this. Not only is technology changing �the way consumers and small business owners shop for local services,� it's changing the way they PAY for both services and products, not just locally, but globally. We've already seen the emergence of payment options like PayPal, but that is just a minor shift compared to what's coming. What's coming is the use of trade credits that will be internally cleared within the exchange network itself. Credit clearing within their own realms is what barter companies have each been doing from the beginning, so they are well positioned to take cashless trading to the next level. The Universal Currency utility that has been established by IRTA (International Reciprocal Trade Association) is a step in that direction in that it provides a means by which exchanges can trade with one another. The ultimate step, however, is to provide a means by which a member of one exchange can trade directly with a member of another exchange. What will it take to accomplish that? The basic requirements are for each exchange to establish an open line of credit for each of its members. Those credit lines will be adequately secured and insured. Further, it is necessary for participating exchanges to expand their membership to include all levels of the supply chain from retailers to wholesalers to manufacturers to basic commodity producers to consumers and workers, so that every member is able to pay their suppliers with trade credit. Finally, each participating exchange must agree to adhere to an appropriate set of standard procedures and protocols relating to the allocation of credit lines and the management of internal operations. A small fee collected on each transaction will provide huge profits for those that can efficiently clear account balances and quickly ramp up the scale of their operations. Editor�s note: A set of standards (standard procedures & protocols) as alluded to by Greco has been a topic of discussion at the last two International Reciprocal Trade Association conventions. In the Editor�s Note of BarterNews issue #64, dynamic changes were alluded to within the business marketplace during the last 20 years that have caused vastly different clientele for the trade exchanges. The landscape has continued shifting, and today�s typical exchange has a preponderance of service businesses as members. Now, in addition to changes such as consolidations and franchising booms, the barter industry must be aware of another growing competitor...technology. Coupled with cash, the historically major rival of barter, it portends additional challenges for the industry. The insidious effects of technology can be observed in the efforts of Craigslist (a classified-ads site) which focuses on metropolitan areas, eBay�s push into the battle for local listings, and the ubiquitous Google with its new service, Google Base. What does that mean? A major shift is underway in how consumers and small business owners shop for local services. The age of online discounts and coupons is here...along with an added ingredient. Everyone will be able to see multiple offers at a glance and get a better sense of the best-available overall prices. Therefore providers will be forced to compete more aggressively. This will greatly effect pricing and competition among local businesses, even within the local trade exchange. All will be competing against the money-saving web opportunities that include rebates and print-your-own coupons. As the small business owner astutely compares the competitive cash pricing in the marketplace against the exchange�s full retail (sometimes inflated) pricing, not to mention commissions paid to the exchange, the difference could be startling. So the barter industry must take note. As Peter Drucker often said, �Nothing is predictable except that today�s profitable business will become tomorrow�s white elephant.� The business model followed today by those in the barter industry is the same as it was back in the early nineteen-sixties. Much has changed in the marketplace since then...is the industry up to the task? IRTA Moving Into 2006 With Central Theme. . . The IRTA Europe Chapter has announced a spring meeting to be held at the Hotel Haarlem Zuid in Amsterdam, The Netherlands, March 24-26. All exchange systems from around the world are welcome to attend. More information will be forthcoming on the IRTA web site at www.irta.com, and interested parties can e-mail krista@irta.com. A new matrix was developed that is determined heavily on the members� rolling 12 month selling history in UC. Said matrix was approved by the committee in August and has been applied to all new and existing members. The Puget Sound Business Journal has named a trade exchange - BizXchange - as one of Washington State�s 100 Fastest Growing Private Companies. Actually, BizXchange was listed 16th on the list, quite an accomplishment for the company which was founded in February 2002 by Bob Bagga, President, Chris Haddawy, Sr. VP of Business Development, and Raj Kapoor, VP of Finance. Bagga was quick to add, �We are only successful when we help our members improve and grow their business.� Kapoor, wearing his finance hat, says being honored as one of the fastest growing companies �validates our business model.� To learn more about BizXchange visit www.bizx.com. International Monetary Systems (OTCBB:INLM) announced the processing of $4.7 million in sales for the month of September, 2005. Revenue produced was $563,000, which represented an increase of 45% over the same period the year prior. On September 9, 2005, Bartercard International announced that they will re-acquire a majority interest in Bartercard USA (BCUSA) for an aggregate cost of $875,000. A newly formed subsidiary company, Bartercard America Inc. (BCA), will acquire the assets of BCUSA for a 20% stake in BCA, make a payment of $275,000 toward BCUSA�s liabilities, and provide first right of refusal on five domestic U.S. franchises to the current BCUSA owners. As part of the transaction, Bartercard International is facilitating the sale of BCA to a U.S. listed public shell. BCA will be valued at $3 million on the reverse merger and intends to raise up to $2 million, without recourse to Bartercard International. At Bartercard International�s Annual Shareholder�s Meeting on October 19, all of the resolutions proposed were duly passed by shareholders with the exception of resolution 4(b) in respect to the re-appointment of Wayne Sharpe as chairman of the company. Accordingly, Sharpe has resigned as chairman and is no longer a director of the company. Christian Williams and Edward Adams, non-executive directors, have been respectively appointed Chairman and Deputy Chairman on an interim basis. Editor�s note: As of October 3, 2005, Sharpe�s beneficial interest of 124,605,878 ordinary shares of Bartercard International represented 54.06% of the company�s issued share capital. Market cap for the firm was $45 million as of August 31, 2005. The first 25 years of the International Reciprocal Trade Association�s existence saw an internal focus. This year, the commercial barter industry removed the blinders with an expanded look at the growing world of cashless trading, at IRTA�s 26 Annual Convention held September 22-25 at the Wyndham Palace Resort & Spa in Disney World. Most of the attendees felt it was one of the most informative and worthwhile conventions ever held, as some new exciting possibilities emerged. Will it be the exhilarating first step that could prove to change the growth and direction of the commercial barter business? the introduction and incorporation of a new program where trade exchange members can drive additional cash business to their establishments through a new rewards program. The convention got off to an auspicious start with a mesmerizing keynote by a powerful advocate of alternative monetary systems, Bernard Lietaer (pronounced Lee-ah-tar). Lietaer, author of The Future of Money: Creating New Wealth, Work and a Wiser World, is a recognized expert on monetary systems. While at the Central Bank in Belgium he co-designed and implemented the convergence mechanism (ECU) to the single European currency system. He also was the co-founder of one of the largest and most successful currency funds, becoming its General Manager and Currency Trader. Lietaer�s message to the attendees was energizing and factual. He provided a 5-year outlook for today�s current financial situation, though many in the audience were stunned by precise information and suggestions of currency upheavals ahead. Yet it was obvious that Lietaer feels barter, especially if the industry can undergo considerable growth, could provide a substantially stabilizing role for what�s expected to be a growing unemployment situation worldwide. According to the monetary expert, businesses, individuals and entire communities, would be better off when barter becomes an integral component with growing usage. Lietaer�s message was especially relevant because the commercial barter industry has never fully comprehended or understood (or even cared about in many cases) what community currencies represented. Although his message to the attendees asserted that the future of money will be complementary currencies, he also was quick to point out that this did not mean that the existing national currencies would be compromised. We in the barter business, with our trade dollars, are in the complementary currency business. But so are others, like the 14 trillion frequent-flyer miles in the marketplace, which at 2-cents a mile translates into a $280 billion currency, and a myriad of other reward programs from hoteliers to major retailers. Additionally, Lietaer reported, there are now over 5,000 social-purpose currencies in existence worldwide. What�s ahead for the commercial barter industry? He contends that it�s really up to a handful of visionaries who are willing to move forward a step at a time, conveying that those within the industry must realize that the first important step is selective standardization for internet barter transactions. He emphasized that this must be done by the industry to get to a higher level, pointing out that the banking industry only became �important� because of standardization. Propitiously, the convention included a 2-hour educational session by standards expert Greg Swann, of the Bureau Veritas Quality International, to further educate the industry on the subject of international standardization. His message was straight forward. Standards include: say what you do, do what you say, and prove it�with written records and results. The barter industry can, Swann said, immediately implement steps that would require little money, but would raise the level of performance within the industry. Will the industry take action on standardization? Historically, after a well-meaning convention is concluded, attendees �go back to business� and little action on what was talked about actually occurs. Special Recognition was given to Universal Currency Broker Jennifer Ashworth and IRTA�s Executive Director Krista Vardabash. The Paul St. Martin Distinguished Service Award, for selfless contributions of time and effort to the industry, went to Richard Logie for his accomplishment in providing a software system for the Universal Currency and for his representation of IRTA in Europe. Scott Whitmer of Florida Barter; Bob Bagga, Raj Kapoor & Chris Haddawy of BizXchange; Sirri Simsek of Turk Barter; Don Mardak of Continental Trade Exchange; and Lois Dale of New York Commerce Exchange. The inductee into the IRTA Barter Hall of Fame was Andrew Federowsky. He, along with Wayne Sharpe and Brian Hall, founded Bartercard in February 1991. In last week�s report we covered his extensive achievements. Not mentioned, however were Federowsky�s efforts and input in developing Bartercard�s online transactional web site (including auction, e-marketplace, and shopping mall) which recently saw the $100,000,000th online dollar traded. Federowsky has sold $10 million in licensees and trained hundreds of people in multiple countries. Global membership doubled under his leadership to over 75,000 with a trading volume of $2 billion annually. 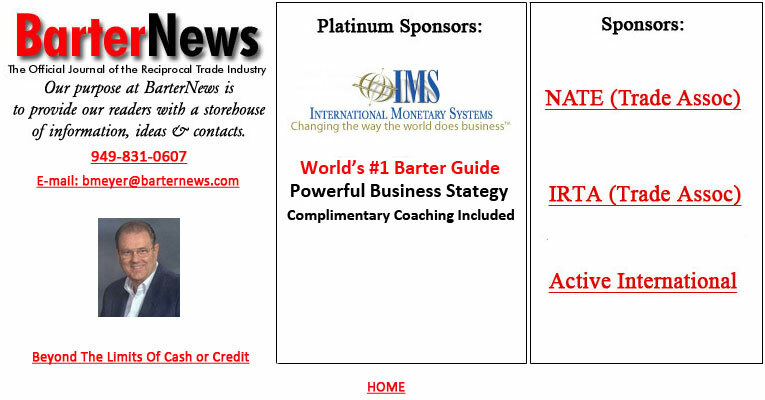 The IRTA convention�s major Platinum Sponsor was Turk Barter. Active International and Florida Barter were major sponsors, and three trade exchanges were sponsored individual events: Barter Consultants, BixXchange and New York Commerce Exchange. ITEX Corporation has been selected by Bentley Commerce to provide processing services to the exchanges with which Bentley has contracts. The new processor will replace the VirtualBarter system the firm had been licensing. Gary Lasater, CEO of TeleTrade, reports that TTI has seen a substantial increase in its transactional processing services for the barter industry. Total combined transactional volume reported was $60,000,017 for the first eight months of 2005. The greatest growth came at eValues.net which showed a 66.7% increase over 2004 with combined transaction volume of nearly $39 million. Teletrade International is the creator of the eValues.net technology, which offers four ways for authorization approval. For further information contact Gary at (303) 840-7172, ext.1. As founding members of the International Reciprocal Trade Association (IRTA) and the National Association of Trade Exchanges (NATE), Sondra Ames and her husband Mike Ames were driving forces in the formative years of the commercial barter industry. Today she�s wearing another hat, that of CEO and co-owner of Wonderland Bakery along with daughter Allyson Ames. It�s a talented mother-and-daughter team, with the artistic inspiration and culinary expertise provided by president and co-founder Allyson. Allyson is a graduate of the Culinary Art Institute of America and has been honored with numerous awards and recognitions for her culinary talents. Allyson has been featured on CNN and has catered the Emmys, Grammys and other award shows. Sondra Ames has a strong business background and extensive ties with charitable, civic and professional organizations that Wonderland supports. Their one-of-a-kind bakery has recently opened at The Bluffs in Newport Beach and offers gourmet cookies, special occasion cookie arrangements, artistic desserts, French pastries, chocolate dipped fruit as well as customized gift packaging. For more information call (949) 640-9095 or go to www.wonderlandbakery.com. A co-founder of Bartercard International, Andrew Federowsky, received well-deserved recognition for his hard work and dedication by being International Reciprocal Trade Association�s 2005 inductee for the Barter Hall of Fame. Federowsky has traveled around the world, building Bartercard as well as promoting barter itself. His vision and efforts have been responsible for establishing regional service centers in Europe, the Middle East and Asia. In 2000 he traveled to the Middle East to negotiate with business leaders from various countries within the region. He sold the first Middle East license, and has since assisted in launching operations in that area...some of which were the first exchange in that country. Bartercard has ten offices in five countries in the Middle East. Federowsky also was responsible for assembling and leading the team that developed Bartercard�s internet technology. He is a Fellow of the Australian Institute of Company Directors (FAICD) and a Member of the Australian Institute of Management. Wallach was unable to attend the convention due to cancer treatments, but he provided the following message to the convention attendees. �I regret that health issues have kept me from attending this year�s IRTA convention. Please be assured that my heart and thoughts are with each of you as you plan the future direction of our industry. �I wish to thank my many friends and colleagues for their support and prayers during this very difficult period of my life. �Don�t get me wrong, I have not given up and I am extremely reluctant to depart from this wonderful life. �During my 30-year career in the Alternative Currency Industry it has been my pleasure to serve on several IRTA Boards of Directors. Over the years each Board seems to have risen to exactly the appropriate level and provided well thought out answers to the difficult situations on their agendas. �The current Board is exceptional, led by Board President Lois Dale and IRTA Executive Director Krista Vardabash. The Board has come a long way in accomplishing its mandated mission of defining, creating, and installing standards of operation and conduct industry wide. �Tom McDowell, I so wanted to be there, shake your hand and welcome you to your first IRTA meeting in many a year. Under your able direction NATE has certainly positively contributed to shaping and defining the Barter Industry. It has always been my goal to see the two industry Associations work closer together and find a path to unity in direction and purpose. �In my view we are neither in the Barter or Trade business. We are business ecologists that provide a currency which represents excess business capacities that without our involvement would go totally ignored and absolutely wasted. �We do a magical thing: we turn this business waste into a currency of great cash replacement value. As a result we capitalize as well as grow companies and stimulate business activity; thereby creating more employment and a stronger economic environment. �Applied on grand scale and on a global basis our non-money currency system will fuel an unparalleled economic boom that will significantly raise the world�s standard of living resulting in extensive increases in nutrition, education, and health care for all of the earth�s people. �It is my belief that those persons in this very room can and will make this vision a reality. Don Mardak, International Monetary Systems (OTCBB: INLM) President and CEO, continues his push forward with the objective of hitting the 10,000 client number...a powerful benchmark in the commercial barter industry. The company�s gross income of nearly $5 million worth of trades for August shattered all previous monthly records. It produced revenue of $605,000, which was a 54% increase over the same period in 2004. IMS has completed the integration of their last five acquisitions into Continental Trade Exchange�s barter network, and now services clients in 32 markets across the United States. Mardak says they have plans on entering additional markets in the coming months. For more information go to the company�s web site at www.internationalmonetary.com. The National Association of Trade Exchanges� Board of Directors has named Fran Crumpton as its new president. Crumpton will replace outgoing NATE President Debbie Lombardi who resigned because she is no longer involved in the barter industry, and therefore ineligible to serve on the board. Patti Falus, owner of Barter Network in Toronto, was elected as the new Vice President replacing Crumpton who previously was serving in that position. Fran Crumpton owns Gulf Coast Trade Exchange in Pensacola (FL), and has served the industry tirelessly in many different capacities over her 21 years in the industry. She will serve as NATE�s president through the Association�s 2007 convention. In May 2005, Crumpton received NATE�s coveted Monkman-Crumpton Award. This award, which in part honors her late husband Bob (NATE�s third president from 1987-1988), recognizes integrity and loyal support to the Association. For more information on NATE go to www.nate.org. Three weeks ago we introduced you to a unique character, one of the top trade exchange salesmen in the industry, 55-year-old San Diegoan Art Kaliel. He refers to himself as �George Costanza� for obvious physical similarities. Kaliel publishes a semi-weekly little newsletter titled �The Green Standard,� sharing some quips and thoughts as well as names of various companies that he serves. This week he was busy sending out post cards from Dyersville (IA), the movie site and home of Universal Studios� 1989 movie Field of Dreams, starring Kevin Costner. He makes an annual pilgrimage to this part of the country from San Diego every year...then on to Chicago�s Comisky Park, the Skydome in Toronto, down to PNC Park in Pittsburgh and then over to the Big Apple. It�s quite a road trip that extends from August 31 to September 5. Along the way he�s smelling the roses, eating hot-dogs, and spending his trade dollars at every opportunity! International Monetary Systems (OTCBB:INLM) has appointed Barbara Martin, a long-time respected veteran of the commercial barter industry, to the position of National Sales Manager. Over the years Martin has done a remarkable job of running regional offices for IMS�s Continental Trade Exchange network. Her elevation to this prestigious and important position shows the growing importance of having a competent on-the-street sales team in addition to inside brokering services. IMS is on track to break the 10,000 client milestone within the next 60 days. According to CEO Don Mardak, the company has a dozen full-time sales representatives who are bringing in around 100 new clients per month. �We intend to continue expanding our training and recruitment program for new salespeople so that we can eventually sign up 500 to 1,000 new members each month. For additional information go to www.internationalmonetary.com. The Bentley Commerce (OTCBB:BLYC) board of directors, pursuant to a resolution by the board dated September 13, 2005, has removed Bruce Kamm as CEO and CFO and from all consulting positions with the company. Anna Taylor has been appointed as Interim Chief Executive Officer and Interim Chief Financial Officer. The 40-year-old Taylor will also continue her current positions of Chief Operating Officer, Executive Vice President and Secretary. Robert Schumacher continues as president and CIO. Prior to joining Bentley Commerce Ms. Taylor served as the District Manager for KinderCare Learning Corporation, a major education corporation that operates over 2,000 centers nationwide. For the past five months, she has had the responsibility for the daily operations at Bentley Commerce...auditing and managing accounts, overseeing its programs, and training and developing new associates. IMS President and CEO Don Mardak reports that in addition to the Nevada clients as well as those in Southern California, the firm will retain UTN�s former owner Greg Pavlov. He will be overseeing the company�s sales force in the Southwestern region and spearhead growth initiatives in that region. For over a decade now, week in and week out, a guy who refers to himself as George Costanza (he�s a ringer for the Seinfeld actor) has been successfully selling the trade exchange concept to the business community in the greater San Diego area. Kaliel has annually been the top salesman in the BXI national organization (recently acquired by ITEX). In an industry where the turnover of outside salespeople is routine, Kaliel is the exception to the rule. Why? Certainly he has a �can do� attitude, but in addition he has astutely developed several unique sales techniques that set him apart from the crowd. One of them is his semi-weekly e-mail newsletter, titled the Green Standard, sent out to his growing list of clients and prospects. It�s not only a fun read, but informative as well. Published tongue in cheek by �George Costanza Productions...any reproduction without written permission is OK by George!� To see what this unusually successful salesman uses as one of the �arrows in his quiver,� e-mail him: arthurkaliel@hotmail.com. This year, the company will complete $40 million in online trade transactions, up from $4.4 million in 2001. Bartercard�s portal is unique in that it not only completes a member�s trade, but also facilitates the transaction of funds. Bartercard enjoyed a ten-fold increase in inquiries from its web sites since Gravitymax reworked Bartercard�s web site structure and design. For more information go to www.bartercard.com. White also pointed out that independent licensed broker Michael Muzzin, owner of an existing ITEX office in Toronto since 2000, purchased the Toronto office previously owned by John Castoro. Muzzin�s expanded office with 650 members will generate $500,000 in cash revenue and $8 million in transaction volume yearly. As of June 30, IMS total assets reached $6,913,341 from $4,870,360 at the end of 2004, with stockholders� equity of $3,942,941 up from $2,976,382. The directors of Universal Direct have announced that an agreement has been reached, subject to shareholders� approval, to purchase the entire issued share capital of Bartercard International. The purchase will encompass the issuance of 217 million new Universal Direct ordinary shares, with the price valuing Bartercard at 65 million pounds. Since Bartercard�s founding, February 1991 in Australia, the growth in new members has been consistently strong and now numbers in excess of 70,000 businesses/companies. Sources of revenue from the firm�s subsidiaries are: trading commissions (from buyer and seller on each transaction) 70%, publication and subscription fees (10%), administration fees (15%), and franchise sales (5%). One of the fastest growing parts of Bartercard�s operation is its e-commerce operation, launched in 2002. Twenty-five thousand items are now displayed on its global site. Revenues for 2002 A$42,063,748; 2003 A$45,580,970; and 2004 A$49,105,352. Profits or losses after tax for 2002 (A$3,212,625); 2003 A$852,914; and 2004 A$2,350,916. Bentley Commerce (OTCBB:BLYC) is offering its affiliated exchanges the CollectAChek (www.collectachek.com) system to recover 100% of the face value of non sufficient fund consumer checks, up to $2,500. There is no cost of collection to their member businesses for these NSF checks, and participating exchanges receive a share of state-authorized recovery fees. �This is part of our on-going efforts to offer innovative revenue opportunities to our online affiliate exchanges, which handle transactions for approximately 18,000 businesses, as well as our off-line trade exchange network that works with an estimated 50,000 businesses,� announced Bruce Kamm, Bentley�s CEO. CollectAChek, a company affiliated with Bentley, recovers bounced checks for a wide range of businesses which include Discount Tire, Meineke Car Care Centers, Goodwill Industries, Subway, Fantastic Sams, Supercuts, Le Gourmet Chef, Kelly-Moore Paints, Boys & Girls Clubs of America, and Jackson Hewitt Tax Services. Seven years ago I shared a �satellite� office with an attorney friend of mine who got to know the barter business pretty well�he had no choice, he could overhear every conversation I had for over a year! But we also get to see the amazing positive things barter does for so many businesses. And NATE is a valuable vehicle that can help all exchanges experience more of those amazing success stories. So as NATE enters its 21st year, it�s imperative that it looks to its past with a sense of pride, its present with a sense of purpose, and its future with an open mind. We as entrepreneurs in the barter business know this all too well�we deal with risks all the time. NATE too operates in an uncertain environment that presents risks of its own. Global TransNet Corp. (OTCBB:GBJX) announced that wholly owned subsidiary LUCRAcard�a trade exchange�permits its members to �cash-out� their excess trade dollars (sales over purchases) at the end of the trading year after $30,000 in business has been transacted within the exchange. Katie Harris, the daughter of Richard Harris, founder of National Commercial Exchange in St. Louis, has established a 501c3 non-profit company. Her goal is to reach children and persuade them to make responsible choices. She does so through assembly presentations involving skits that kids can relate to. Her mission, called �City Conquest,� came about because of the drinking related, fatal car accident her older brother Todd (Richard�s son) had in 1998 when he was 19. Katie�s �team� is traveling around the country to schools, churches, temples, even local jails to make a difference. They need help with expenses for postage, video productions, a van to transport the team, web site upkeep, a trailer for props, etc. If you�d like to learn more about �City Conquest,� see a promo tape, or provide donations, call National Commercial Exchange (314) 567-7890 and ask to contact Katie. The worldwide barter marketplace is huge and diverse, with many facets to it. Accordingly, the International Reciprocal Trade Association (IRTA) looks at and acknowledges alternative monetary systems on their newly-upgraded web site. Some excellent material is available, including a section which provides links for little-known information about other alternative monetary systems. For more information go to www.IRTA.com. Don Mardak, CEO of International Monetary Systems, has concluded their first phase of funding, having secured $610,000 from three private investors. The convertible bridge loans have terms of two and three years. International Monetary Systems (OTCBB:INLM) has also announced an enhancement to its shareholder communications by maintaining a chat forum on www.HotStockMarket.com. �Creating efficient and effective investor communications has always been a priority for us at IMS,� CEO Don Mardak stressed. The National Association of Trade Exchanges Board of Directors has developed a new credit policy for all BANC members. The policy has resulted in 19 BANC members getting an aggregate increase in their credit lines of $756,500, and twelve members receiving reduced credit lines totaling $495,000. �Based on our initial success of a new marketing campaign, next month we will expand our effort to market our trading technology, trade card and other revenue generating opportunities, to about 200 trade exchanges,� exclaimed Bruce Kamm, Bentley�s CEO. The company undertook to create a singular web site platform that addressed the consumer needs for each of its countries� markets, with regional content management all under a unified global brand. In December 1976, Jack Denny and Phil Gill became the first two area franchise directors for BXI. Gill retired several years ago and Denny, one of the real gentlemen in the barter industry and the area director for Oklahoma City, stepped down effective December 1, 2004. Still physically and mentally active at 72, Denny expects to remain involved and continue to trade...but it will be on his own account now. BarterNews and the barter industry salutes Jack Denny for a job well done, and for his 28 years of effort on behalf of the hundreds of businesses he helped in Oklahoma City! International Monetary Systems processed $37 million in barter transactions (up from $32 million in 2003), according to the company�s Annual Report for the year ending December 31, 2004. Revenue generated was $4,732,960, versus $3,972,386 of a year earlier. Operating expenses for 2004 increased by $816,982 or 22% over 2003. All the additional operating expenses were a result of the acquisitions made during 2004 along with investor relations� expenses for marketing stock. Although IMS now has more employees, the personnel needed to operate the acquired offices has been reduced from that under previous management. Therefore, in 2004, Continental Trade Exchange operations had net income before taxes of $519,763. After expenses and taxes net income was $91,012. Payroll expenses increased 23% from 2003. Occupancy expenses decreased 34% to $284,635. Selling and other expenses increased 52% to $203,011. General and administrative expenses increased 33% to $1,088,529 in 2004. IMS had net income of $36,246 for the calendar year 2004, compared to a loss of $242,259 for the prior year. Bentley Commerce Corporation (OTCBB:BLYC) has signed an exclusive marketing agreement with Radio Forecast Network (RFN), that gives Bentley exclusive rights to market RFN�s radio spot inventory to affiliate exchanges and their members. RFN (www.radioforecastnetwork.com), through a national partnership with WeatherBug, provides mp3-quality customized weather reports to more than 60 radio stations nationwide, and anticipates increasing its distribution network to over 300 stations by year end. WeatherBug, the owner of the world�s largest proprietary weather network, has over 8,000 tracking stations and more than 1,000 cameras strategically placed at schools and public safety facilities throughout the nation. RFN trades its weather reports for spot advertising, thus providing radio stations with a professional full time weather staff without the cash expenditure. Radio stations interested in custom branded weather reports, paid for with spot advertising inventory, should contact RFN or Bentley Commerce for further details. Domains using TTi�s online systems, including www.thebanc.com and www.intercambialo.cc, saw $18.2 million total volume for the first quarter of 2005 versus $13.9 in 2004. The International Reciprocal Trade Association�s Board of Directors met April 8 in Istanbul, Turkey, at the headquarters of host Turk Barter. The meeting was attended by all nine board members and IRTA�s executive director, Krista Vardabash. Mr. M. Sirri Simsek, Turk Barter�s president, was interviewed on several Istanbul economic television programs along with Ms. Vardabash. There was also considerable front page coverage by Istanbul�s leading daily newspaper. Vardabash explained that the round-table was a furtherance of the mandate by IRTA�s membership in Cancun, Mexico, last fall at the 25th anniversary celebration Barter Congress. Two weeks ago, in our April 19 Tuesday Report, we noted International Monetary Systems 12th acquisition of Eagle Barter Exchange of Chattanooga. IMS (OTCBB:INLM), parent company of Continental Trade Exchange, has just concluded another purchase�the assets and client base of United Trade Network�s office in Reno. The facility serves more than 350 clients in the Reno and Lake Tahoe markets. Because of recent acquisitions and present negotiations, International Monetary Systems is offering guidance on its projected results for calendar 2005. The company expects to increase its volume of barter transactions (one side only) from $37 million in 2004, to $48 million in 2005. This level of trade volume should result in gross revenue of approximately $6 million in 2005, an increase of 28% over the 2004 total of $4.7 million. A comparable increase in profitability is also expected. For more information go to: www.bentleycommerce.com. An incredible 3,500 acre 5-star winery/resort (The Chateau Elan) was the venue for the 21st convention of NATE. Located about an hour�s drive north of Atlanta, it was the most spectacular setting ever for NATE�s annual effort. Ric and Andrea Zampatti and the service-oriented staff from The Barter Company were responsible for lining-up the impressive resort where everything�room, food & beverages, along with upscale spa services, were all 100% trade. President�s Award to Johnny Eagle of Eagle Barter Exchange. The Monkman/Crumpton Award (NATE�s most prestigious award) to Fran Crumpton of Gulf Coast Trade Exchange. Aside from the many activities of the convention, the resort provided an equally impressive experience. The very warm and genuine services of the Chateau�s entire staff, beginning with its hands-on president and CEO Henk Evers, was a pleasure. IRTA�s 26th Annual Conference is slated this year for September 22 to 25. It will be held at the Wyndham Palace Resort & Spa in Disney World of Orlando, Florida. Registration information including �Early Bird� rates are posted on the IRTA web site at www.irta.com. Last year marked 25 years for the International Reciprocal Trade Association. This year marks the first of the next 25. Precisely why this year�s convention is the FIRST of its kind. IRTA is inclusive of everyone and anyone who is affecting the world with their dreams and visions of changing the way businesses, communities, and individuals think about money and credit, and different currencies. International Monetary Systems (OTCBB:INLM) has acquired Barter Business Unlimited (BBU) of Connecticut, adding to its growing Continental Trade Exchange network. The Hartford-area operation, founded by Debbie Lombardi, is one of America�s leading trade exchanges. Lombardi, BBU�s founder and president, is the current president of the National Association of Trade Exchanges and the first woman ever elected to that position. Continental Trade Exchange, a subsidiary of International Monetary Systems, now serves more than 8,500 businesses representing over 14,000 cardholders. The best month in the company�s history as well as the securing of additional funding was announced by the New Berlin (WI) headquarters of IMS last week. For the recent month of April reported revenue was $411,000, an increase of more than 15% over the same month in 2004, and the highest total recorded this year by the company. CEO Don Mardak also disclosed that additional open-ended funding has been secured from private investors, increasing the total from a private placement to $810,000. �These additional funds will allow us to complete other trade exchange acquisitions that are currently in discussion and will provide us with additional working capital,� he noted. For more information go to: www.internationalmonetary.com. This year�s ITEX Annual Broker Network Convention was held in Seattle, May 22 - 26. Independent licensed brokers and franchisees from more than 60 ITEX offices in the U.S. and Canada gathered to discuss initiatives for expanding the cashless marketplace in an online and off-line world. The ITEX brokers came away with exciting ideas about how to stretch boundaries and how to step out of the comfort zones of life. IMS, through its Continental Trade Exchange subsidiary, processed more than $5.2 million worth of trades which produced a gross income of $540,000. This represented an increase of 53% over the same period in 2004, and an increase of 31% over the company�s April 2005 sales. For more information go to www.internationalmonetary.com. + Revenue for the quarter was $2,387,000, compared to $2,275,000 in the third quarter of fiscal year 2004. Revenue for the first nine months of the fiscal year was $7,661,000 compared to $7,770,000 for the same time period in fiscal year 2004. + Income from operations for the quarter was $148,000, compared to $451,000 in the same quarter for the prior year. Net income in the quarter ending April 20, 2004, included several non-recurring income items. + Total net income was $2,132,000, or 11-cents a share, for the third quarter of 2005, and includes a $1,960,000 income tax benefit. Total net income for the first nine months of fiscal year 2005 was $2,965,000, or 16-cents a share. + Assets increased to $5,881,000 compared to $2,923,000 at the end of the previous fiscal year, July 31, 2004. An income tax benefit was attributed to $2,260,000 of the asset increase, or 12-cents a share. + Cash increased to $1,268,000 compared to $215,000 at the end of the previous fiscal year. The company has no long-term debt. The theme of this year�s IRTA Convention, to be held September 22-25 in Orlando, is �Uniting People & Standards In A Cashless Trading World.� The Friday morning kick-off will open with international financial expert and currency authority, Bernard Lietaer. Lietaer has a distinguished and varied background: He�s the author of The Future of Money: Creating New Wealth, Work and A Wiser World. While at the Central Bank in Belgium he co-designed and implemented the convergence mechanism (ECU) to today�s successful euro currency system. During that period he also served as President of Belgium�s Electronic Payment System. A natural and obvious progression has taken place with IMS� Continental Trade Exchange, now one of the largest barter company�s in the world. They�re moving forward by officially creating a corporate barter division. T.J. Donnelly, CEO of West End Media Group in Irving (TX), has announced expansion of his operations with two new office openings�Houston and San Diego. Founded by Donnelly in 1990, West End Media Group has been serving the south and southwest with bartered media. Ted Holcomb, a veteran of 35 years in radio, television, print and web broadcasting, has joined West End Media Group as its president. Holcomb�s background ranges from working at an ABC held and operated radio station in Chicago to owning Muzak franchises in several cities. He has worked at all levels of management in the media, from sales representative to Vice President of Sales for a CBS Station in Lexington (KY). In the past 3-years he�s sold $2.5 million in new business in network radio advertising. He was also instrumental in the success of a start-up construction industry web site. BXI Exchange was started by M.J. McConnell back in 1960. McConnell, a member of IRTA�s �Barter Hall of Fame� was the acknowledged father of the trade exchange industry in America. And for many years BXI was the undisputed powerhouse of the industry. In the 1980s, for instance, the company could proudly claim a membership base exceeding 20,000; in those days the future seemed unlimited. How times have changed! Despite some capable brokers in the field, the membership roles have plummeted year after year for nearly a decade. While conjecture for the demise can be debated, the fact is this once proud organization is a shell of its former self. At the time of the acquisition by ITEX, BXI�s membership roles totaled 8,000...still a considerable number, but a far cry from the days when the company was flying high. Steven White, the astute and enterprising CEO of ITEX (OTCBB:ITEX), took advantage of the situation and propitiously snapped up the once-outstanding BXI organization with a bold move last week for $3,680,000. An acquisition that stunned the industry! ITEX now has a membership in excess of 21,000, the largest in North America. Annual transaction volume will be north of $300 million, and over 300,000 transactions are expected to take place per year�or one nearly every 30 seconds of every business day. Integration of the ITEX and BXI trading networks, where members of each will trade through one entity, is expected to be completed by the end of July. The company will operate from Bellevue (WA) under the ITEX brand. For more specific details on the merger go to www.itex.com.